Petrochem Middle East (PME) is the largest independent Chemical Distributor in the Middle East and 11th largest in the world. Established in the year 1995 in the United Arab Emirates, the Company has fast transformed the petrochemical business in the region with its wide product range and unique service proposition. We adhere to stringent quality, health and safety regulations and ensure safe and efficient operation at our facilities. We are ISO 9001, ISO 14001 and OHSAS 18001 certified. We have offices across UAE, India, China, Singapore, Taiwan and associate offices in United Kingdom, Antwerp and Egypt. Our Terminal is a state of the art facility in Dubai’s Jebel Ali Free Zone, which handles more than 180 variants of chemicals. Established in 1999, the existing facility includes 3 dedicated Jetty pipe lines, 23 bulk storage tanks for import and storage of products in bulk with total storage capacity to 25650m3, drumming facility, tanker/ISO tanks loading gantry with top loading arms, 5 Canopies for storage of NFPA class 1 B & C chemicals with approx. 35,000 drums storage capacity, a state of the art firefighting system covering all areas with foam and sprinkler and all other associated infrastructural facilities. The terminal exports more than 700,000 metric tons of products to all the corners of the world. The dedicated and ultra-modern fleet of road tankers and large trailer trucks, as well as our in-house logistics and operations department ensure quick and on time deliveries. It is our vision to be the Partner of Choice. Petrochem is built on its commitment to deliver. We are a goal focuses organization providing exceptional marker access to our principals, best in class products and services to our customers and high return on investment to our shareholders. At Petrochem, our dynamic team work together to define new standards of punctuality, functionality, and quality of service. And they make it their business to offer clients the competitive edge. Driven by passion and a need to succeed, Yogesh Mehta (Yogi) established Petrochem Middle East in 1995. Petrochem Middle East has since grown from strength-to-strength to become the largest independent petrochemical distributor in the Middle East, with a state-of-the-art storage terminal for bulk and drum chemicals. A Harvard Business School Alumnus, Yogi’s success story has been widely documented, and in 2010 he was ranked seventh in the Arabian Business Indian Power List. He strongly believes that the Organization’s success has been the result of forecasting and anticipating market and customer needs. He is an enthusiast of “the people”, constantly asserting that his employees are the business’s greatest assets.His grasp on the dynamics of the chemical industry, and on building a strong reputation with buyers and sellers in the fraternity has raised the company to new heights. 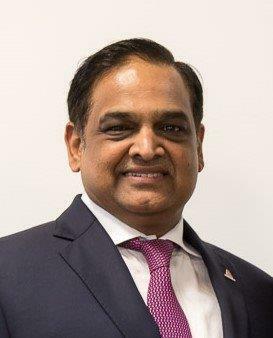 Venu has been with Petrochem Middle East for over nineteen years during which he has played a crucial role in taking the business from a small trading company to a global enterprise that currently trades 180 chemicals across 45 cities globally. Along with driving the organizations global sales force, Venu also works hard at maintaining relationships with manufacturers and suppliers, and setting budgets and targets for the sales team globally. A Harvard Business School Alumnus as well as graduate from Bangalore University, Venu has a total of almost two decades of experience in the chemical trading industry. His expertise in key account management and strategy, as well as his keen leadership skills and knack for innovation, have rendered him indispensable to Petrochem Middle East. Mark is a qualified Chartered Accountant from South Africa and holds a post graduate diploma in Accounting & Taxation from University of Kwa-Zulu Natal in South Africa. His experience covers a variety of different industries, including oil & gas, construction, real estate, hotel investment & hospitality, logistics, freight forwarding, supply chain and shipping. During the course of his career he has worked as the Finance Director with companies like Delmas Shipping based in South Africa (a wholly owned French company with representative offices in 22 countries across Africa Middle East and Asia), Hellmann Worldwide Logistics, Dubai World - Istithmar and Al Hamra Group LLC in the UAE. Nazan manages all activities relating to bulk liquid chartering and the movement of materials along the supply chain, from inventory, supervising staff and anticipating challenges, to scheduling deliveries, transacting with carriers and increasing efficiency. Nazan holds a Bachelor of Science in Industrial Engineering and has also obtained a Master of Business Administration in Business Management from the eminent American institution, Hartford University. Nazan’s more than 15 years in the industry has seen her work in various capacities, primarily for shipping companies. Prior to joining Petrochem, she spent almost ten years at Hoyer Odfjell Dubai, where she moved through the ranks to become Senior in the field of Logistics, Supply Chain and Chartering. Nazan’s other work experiences include Sales and Operations positions in Seven Seas Shipping and Seagull Shipping. Suresh has been with the company for fifteen years, since February 1999. His role includes market research, forging and maintaining relationships with customers and overseeing operations in the sales division of the company. Suresh obtained a qualification as a Paint Technologist from the well-renowned University Department of Chemical Technology in Mumbai. Additionally, he graduated with a Master of Marketing Management from the prestigious Jamnalal Bajaj Institute of Management Studies, Mumbai, in 1994. Suresh has worked in different capacities in top management positions at leading industrial houses in India, including Goodlas Nerolac (now known as Kansai paints), Garware Paints and Kirloskar Brothers. With nearly 25 years’ worth of experience in the industry, Suresh, and his capabilities are assets to Petrochem. His main areas of expertise are paints, and strengthening customer and supplier relationships. Ramesh supervises the logistical planning and implementation of operations, while complying with safety and quality standards, and managing a multi-disciplinary team. Ramesh holds a Bachelor of Chemical Engineering Degree from the respected Pune University in Maharashtra, India. For twelve years, Ramesh was employed at Aegis Logistics in Mumbai, India, the last position that he held at Aegis was, Senior Manager of Operations. Collectively, Ramesh has 20 years of industry experience, and his contribution to Petrochem has been invaluable. His core competencies include planning, resource utilization, quality management, logistics and manpower management. Ramesh is also involved in financial planning for logistical reasons; this entails cost control activities and budgeting with internal departments as well as external parties, such as suppliers. He has also been key to ensuring that the business meets health, safety and environmental standards, resulting in Petrochem obtaining its relevant ISO and OHSAS certifications. Manish is a veteran in the chemical distribution industry in India with over 25 years of experience. He joined Petrochem in 2004 and played a crucial role in setting up the business for Petrochem in India, from registration to a million dollar turnover year on year. Manish’s key responsibilities at Petrochem involve forging new relationships with suppliers and customers, market analysis, as well as maintaining complete control over the business. Manish has a Diploma in Export from the Indo – American Institute as well as a Bachelor of Commerce from Mumbai’s distinguished Narsee Monjee College of Commerce and Economics. His employment history includes a year at Overseas Polymer Pvt Ltd. where he turned around the chemical distribution division of the business around. Manish was also a partner and director at ECHJAY Chem Impex Pvt Ltd. among others. With his key skill of developing and running profit centers, Manish is a core asset to Petrochem. * The File is required.